You can own this Life magazine with Ali on the ropes for $40.00, plus shipping. You can also own this Life magazine pictured for $40.00 , plus shipping. I don't own a Mosin~BUT I do have this heavy 50 cal. 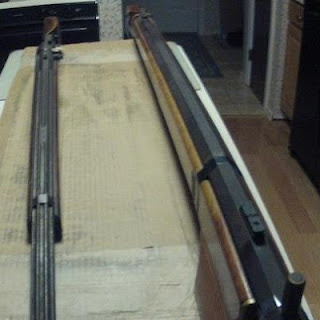 This past week I picked up 2 bench guns. Both 50 cal. Not much info from the guy I got them from. So I was told the light ML is 13 pounds, Left handed ,1-1/8" bbl fluted, side back action lock marked Manton. It appears to be a re-worked older lock on a modern ML'er. Stock is unknown wood, maybe a maple of sorts. ML'er #2 is a 33 pounder, 1-1/2" dia bbl. The 33 pounder is a underhammer. Stock appears to be cherry but I'll not swear to that. I did not weigh these I'm just going off what I was told. No sights came with either one. This is a mistake of the garage sale hawks. They ask the owner if they have any firearms and when 2 like these appear they run off and forget about the accessories. As we all know the sights and accessories are usually worth more than the firearms themselves. So I got them 3rd hand with no original owner info. I did have to laugh as they were first described as being circa 1940-50's. One good note is both came with their false muzzles for loading! Double triggers on both work. Both bores are in fair to good condition considering how long they have set in a closet. A few patches soaked in CRC Power lube and the old lube & red fuzz started coming off. I know these ML'ers will make a fella a good project to undertake. The lighter ML'er wasn't to heavy that it could be shot off-hand if you had a mind to. I'll clean them up and get more detailed pictures , then post for sale later on. Picked up a "lot" of shotshells last night. 16ga & 20ga birdshot and 31 boxes of slugs. Also 12ga classic slugs anyone local need any "classic" slugs these are priced at $2.00 per box of 5. Included in this package were some Remington and Winchester saboted slugs; all 12 ga.
3 boxes of 16ga Winchester Super X "yellow box" will sell for $15.00ea. 2 are #4 shot and 1 is #5 shot. Lies Lies Lies why do people tollerate the lies from government? It can't be that or it can be that government thinks "we The People" can't handle the truth after so many years of being lied to. OR, maybe it's the people are so clueless they like being lied to.